Betty Crocker has created some fabulous Spring Recipes and we are even giving away the Betty Crocker ingredients to help you create these recipes to enjoy. 1. Grease 13x9‐inch (3‐quart) glass baking dish with shortening or cooking spray. 2. Layer ham, potatoes, bell pepper, onion and 1 cup of the cheese in baking dish. In large bowl, stir Bisquick mix, milk, pepper and eggs until blended. Pour into baking dish; sprinkle with remaining 1 cup cheese. Cover; refrigerate at least 4 hours but no longer than 24 hours. 3. Heat oven to 375oF. Bake uncovered 30 to 35 minutes or until light golden brown around edges and cheese is melted. Substitution: Try different types of cheeses in this recipe. Swiss and Monterey Jack work well, but you can also try seasoned cheeses, such as shredded taco cheese or pepper Jack cheese. 1. Heat oven to 375°F. Spray 36 mini muffin cups with cooking spray. 2. In large bowl, stir cookie mix, ground almonds, butter and cream cheese until soft dough forms. 3. Shape dough into 36 (1 1/4‐inch) balls. Press each ball in bottom and up side of muffin cup. 4. Bake 12 to 15 minutes or until golden brown. Cool completely in pan, about 30 minutes. 5. Remove cookie cups from pan. Fill each with about 1 1/2 teaspoons lemon curd. 6. In small bowl, mix frosting and whipped topping until well blended. Pipe or spoon 1 rounded teaspoon frosting mixture on top of each filled cookie cup. Top each with lemon peel and almonds. Store covered in refrigerator. How‐To If you only have one 12‐cup mini muffin pan, shape all of the dough into balls. Fill the pan and cover the remaining balls to keep them from drying out. After baking, cool the muffin pan completely before refilling it with dough. Purchasing Find lemon curd next to the jams and jellies at the supermarket. You might like to try lime or raspberry curd. 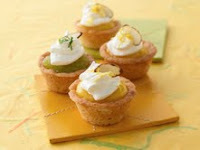 Substitution Betty Crocker® whipped cream cheese frosting or whipped cream frosting can be used for the fluffy white. Combine convenience and great taste by adding strawberry yogurt to cake mix! 1. Heat oven to 350°F (325°F for dark or nonstick pans). Generously grease and lightly flour bottoms and sides of two 8‐inch or 9‐inch round pans, or spray with baking spray with flour. 2. In large bowl, beat cake mix, water, oil, egg whites and yogurt with electric mixer on low speed 30 seconds; beat on medium speed 2 minutes (batter will be lumpy). Pour into pans. 3. Bake 8‐inch rounds 27 to 32 minutes, 9‐inch rounds 25 to 30 minutes, or until toothpick inserted in center comes out clean. Cool 10 minutes. Run knife around sides of pans to loosen cakes; remove from pans to cooling rack. Cool completely, about 1 hour. 4. Spread 1/3 cup frosting over 1 cake layer to within 1/4 inch of edge. Cut about 10 strawberries into 1/4‐inch slices; arrange on frosted layer. Top with second layer. Frost side and top of cake with remaining frosting. Cut remaining strawberries in half; arrange on top of cake. Store loosely covered in refrigerator. Yoplait is a registered trademark of YOPLAIT Marques Internationales SAS (France) used under license. WIN: 24/7 MOMS and Betty Crocker are giving away 1 package of each: Bisquick, Betty Crocker Sugar Cookie Mix and Betty Crocker Super Moist White Cake Mix. US entries only and one entry per person. Winner will be chosen on April 16, 2011. **We received a complimentary Bisquick, Betty Crocker Sugar Cookie Mix and Betty Crocker Super Moist White Cake Mix for review no financial compensation was received. 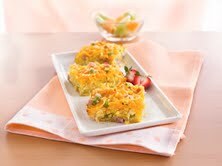 Betty Crocker provided recipes, mixes and giveaways. Betty Crocker makes life so much tastier!!! I'm an email subscriber. I subscribe via email. The Strawberry Yogurt Cake sounds so good! Thanks! I like 24/7 Moms on Facebook. the breakfast bake sounds YUMMY! I would love to make that cake! I'm already an email subscriber!! I am a 24/7 MOMS Subscriber. Love Betty Crocker short cut recipes. I'm an email subscriber. I am a current email subcriber. I'm already a subscriber. Thank you for the lovely giveaway. I'm already a subscriber. Thank you for the giveaway! I am an e-mail subsriber. I am a subscriber and use Betty Crocker products all the time. I'm already a subscriber. Thanks! I'm a subscriber - Thanks! I'm a FB fan - Thanks! I have subscribed, Thanks for the great contest. i follow on facebook! Christi Copeland S.